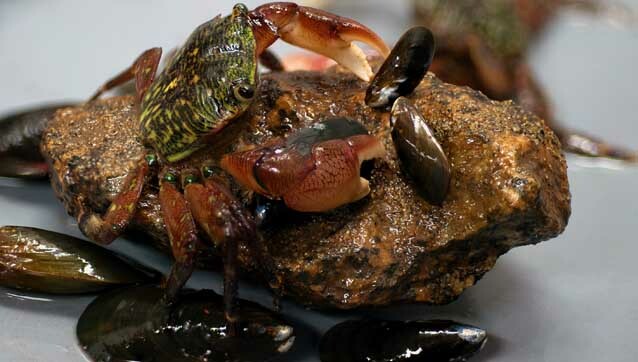 Ocean acidification may cause shifting predator–prey relationships between species like lined shore crabs and mussels. The sea surface and sunlit waters just below invite studies of plankton and the biogeochemistry of a changing ocean. An area without sunlight or solid surfaces and often low levels of oxygen, the midwater of the ocean is the largest habitat on earth. Bubbling gases, volcanic eruptions, landslides, and changing biological communities are among the complex processes of the deep seafloor. The Submarine Volcanism Group recently mapped and explored the lava flows on Axial Seamount in the Pacific Northwest. Scientists compare the drifting animal community in the Sargasso Sea 40 years later.